When one parent receives a diagnosis of Alzheimer’s, the entire family feels the devastation. However, it’s especially important to support your healthy parent during this time. There are several ways you can pitch in to help. All family members face several emotions following an Alzheimer’s diagnosis. However, it’s especially important that your other parent accept and understand the ramifications of the news. Combine efforts with your siblings to reassure your mother or father that you’ll be there to help. Take the time to learn all you can so you’re prepared for what lies ahead. Prepare your parents by keeping them informed. While the family is gathered, consider making plans for the coming months and years when the disease process progresses. A diagnosis of Alzheimer’s disease can be devastating for the whole family, but you’re not alone. The days, weeks, and months following an Alzheimer’s diagnosis can be challenging for both seniors and their families. However, these challenges can be made less stressful with the help of caregivers trained in professional Alzheimer’s care. Huntsville Home Care Assistance is here to help your loved one enjoy the golden years while simultaneously managing the symptoms of Alzheimer’s. Your unaffected parent may feel guilty about not noticing the symptoms sooner or feel that he or she somehow contributed to your other parent’s development of Alzheimer’s. Gently inform your parent that researchers are unable to completely determine who will develop cognitive impairment. As such, your parent had no way of knowing Alzheimer’s would develop. As the disease progresses, your healthy parent may become reluctant to leave his or her spouse’s side. The afflicted parent may not want to be left alone, and the other parent might fear for his or her spouse’s safety. The devotion becomes dangerous when the healthy parent no longer takes the time to eat nutritious meals, take a bath, or get enough sleep. If this problem should arise, remind your parent that he or she must focus on self-care to be emotionally, mentally, and physically able to care for the afflicted parent. Offering to help in any way possible relieves your healthy parent of some of the caregiving duties. 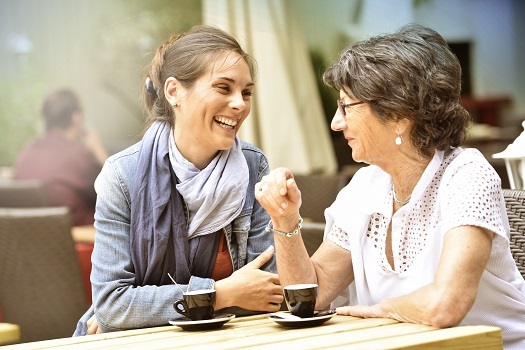 Spending time with your parent living with Alzheimer’s enables your other parent to take a break and run errands, go shopping, or just get away for a short time. You and your siblings could offer to prepare meals, do laundry, or take care of other household chores. Encourage your parent to go see a movie. Perhaps he or she might like to unwind by going fishing for the day. Maybe talk him or her into going away for a weekend with other family members or friends. You can also help your parent take a much-needed break from caregiving by arranging for a professional caregiver to take over for a few hours a day or a few days a week. Families looking for top-rated Huntsville in-home care providers can reach out to Home Care Assistance. From respite care to specialized Alzheimer’s, dementia, stroke, and Parkinson’s care, there are many ways we can make life easier for seniors and their loved ones. Sometimes adult children are busy with work or their own families and are unable to help their parents as often as they might like. Under those circumstances, look into getting around-the-clock assistance from home care professionals. Agencies typically employ people who perform a variety of tasks, from performing basic housekeeping duties to providing medication reminders. A caregiver with experience in caring for older adults living with Alzheimer’s also benefits the healthy parent by giving him or her information and guidance. Being a caregiver for a life partner with Alzheimer’s can be overwhelming, and partners need as much support as they can get. Caring for a senior loved one can be challenging for families who don’t have expertise or professional training in home care, but this challenge doesn’t have to be faced alone. Family caregivers can turn to Huntsville Home Care Assistance for the help they need. We provide high-quality live-in and respite care as well as comprehensive Alzheimer’s, dementia, stroke, and Parkinson’s care. Trust your loved one’s care to the professionals at Home Care Assistance. Reach out to one of our compassionate Care Managers today at (256) 716-9940.